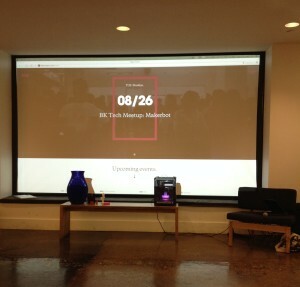 Brooklyn, August 26, 2014 – I was a little early for the Brooklyn Tech Meetup at Huge’s offices in Dumbo. So I had time to go to the waterfront and enjoy the view of the Manhattan skyline that gleamed in the sunset. With such a start I expected the Meetup to be a great event – and I was not disappointed. After a short pitch by Heatseek NYC, one of the Big Apps Competition winners, Maureen Coiro and Ben McCallum of the Brooklyn-based 3D – manufacturer MakerBot went on stage. Maureen began with an introduction about the company, and how 3D- printing will lead into the next industrial revolution. Creative minds only need a desktop computer, tablet, smartphone and a desktop 3D- printer to transform the way we do business. MakerBot is setting up an ecosystem for the 3D-Printer community. So far they have built an app that allows 3D-printer users to monitor and control the printing process and among their online community MakerBot thingiverse, pioneers are freely sharing their blueprints and 3-D models.